Seems like I’m mostly posting about food here. But what’s not good about food anyway? Especially Japanese food! This is an easy recipe I invented as I have been running out of easy lunch ideas for me and the little one. I always make it a point to make meals that both of us can eat. This means it should be quick, easy, must have little to no salt, and nutritious but with lots of flavor. 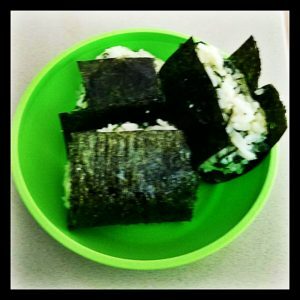 This is not your traditional onigiri. Heat the olive oil in a pan. Saute the chopped spinach and garlic powder until spinach is a bit wilted, about 3-5 minutes. Turn the heat off and let spinach cool down. In a bowl, put the rice, spinach mixture, cheese, and mayonnaise. Mix well and form into small balls or triangles. Wrap with nori strips and serve. And voila! You have a yummy and nutritious Japanese-inspired lunch!